Costco has Washi-Tape! I can say that with authority now, although a few days ago I had no idea what Washi-tape was. Washi tape is a beautiful, textured, semi-transparent Japanese, patterned tape that is used for craft projects. 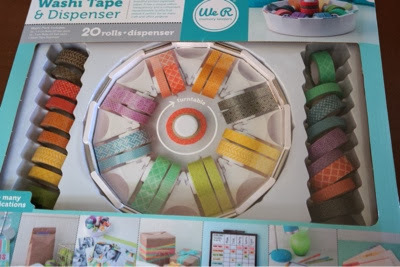 I'm not sure how I'm going to use it, but Pinterest has more than one Washi-Tape idea board. In my Costco, this was in the Christmas toy aisle rather than in the office supply aisle where most craft supplies are located. I paid $19.99 for the dispenser, and 20 rolls of tape (2 sizes of tape). Warning! My Nashville Costco looks almost sold out, so I would buy this soon if you want it. Win 100$ Gift Card from Addicted to Costco!